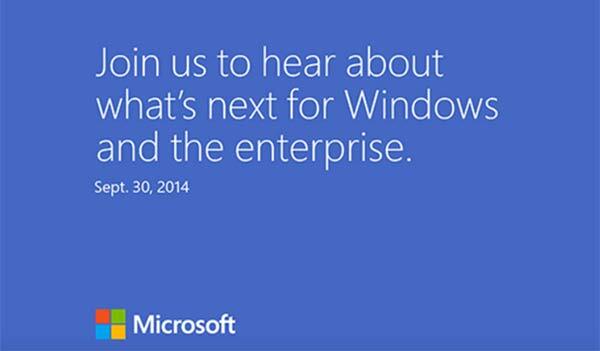 Microsoft has sent out invites to the press for an event where it will discuss "what's next for Windows and the enterprise". The event will take place on 30th September and top ranking Microsoft executives Joe Belfiore and Terry Myerson will both be presenting. What's the focus of the show likely to be? Even before this announcement we were expecting a late September / early October Windows 9 (codenamed Threshold) announcement and the release of a developer preview version of the OS. Sites including The Verge reckon that that we will see the discussion, dissection and delivery of the 'Windows Technical Preview'. A lot of the information we see at the San Francisco event might have already been trailed if the recent spate of screenshots and videos are genuine. Yesterday we saw clear and concise video demonstrations of the Windows 9 notification Centre and Virtual Desktop functionality. A few days earlier a video run-though of the new Start Menu in action was published. We also hear various reports of Cortana coming forward to do more in Windows proper, as we reported here. Most of the above leaks are UI elements that are easy to capture and see the changes of in video but Microsoft's event is supposed to be focussed upon "enterprise and power users of Windows" reports The Verge, so should contain a good chunk of info about changes 'under the hood' too. We ought to hear and see more evidence of the disparate versions of Windows getting closer together as Microsoft's One Windows thrust. However we must remember that Windows Phone and Windows RT (Windows Threshold for ARM) won't be walking down the aisle together until Jan/Feb next year.